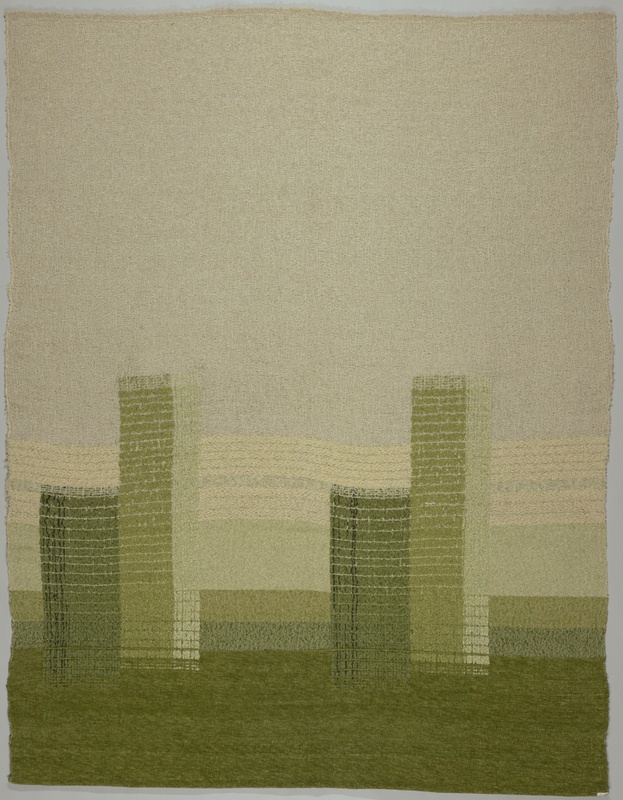 This wall hanging, designed and woven by Maria Kipp, brings to mind an abstracted Los Angeles landscape. Hazy with mauve and pink smog, the horizon glitters with gold metallic strips of weft, reminiscent of the sun peeking from between the clouds. Its soft palette, hints of structural dimensionality and use of abstracted forms are typical of Kipp’s work, who was renowned for both her technical prowess as well as her shrewd and disciplined business acumen. Maria Kipp was a German-born émigré who moved to Los Angeles in 1924 and opened a successful textile firm. Highly sought after in the mid-20th century, she created handwoven textiles for commercial commissions like the superliner SS United States, Airforce One, and the Beverly Hills Hotel. She was also a favorite for interior designers of the Hollywood elite – Frank Sinatra, Loretta Young and Rita Hayworth were her clients amongst countless others. Why called Emerald City? A nickname for LA?